According to research data from Counterpoint’s Market Monitor, Q1 2014 was the biggest quarter for smartphones in the US market reaching 33 million units (shipped, not sold) which represent a staggering 87% of the total handset shipments during that period. Apple iPhone remains the top smartphone in the US, while Samsung takes the lead if you count both feature phones and smartphones. Apple and Samsung together account for over two-thirds of the smartphone market. If you look at the graph above, you'll notice Samsung is trailing not too far behind Apple, even though the latter only ships 2-3 phone models at any given time. Android smartphones account for 59% of the smartphones shipped during Q1/2014. Windows Phone's share grew quarter on quarter but still represents less than 4% of the smartphones shipped in the US. Over 75% of the smartphones shipped were LTE-capable, of which a majority (over 70%) came from Apple or Samsung. Apple's iPhone captured more than half of Verizon's and AT&T smartphone shipments. Samsung was the top selling brand at T-Mobile. 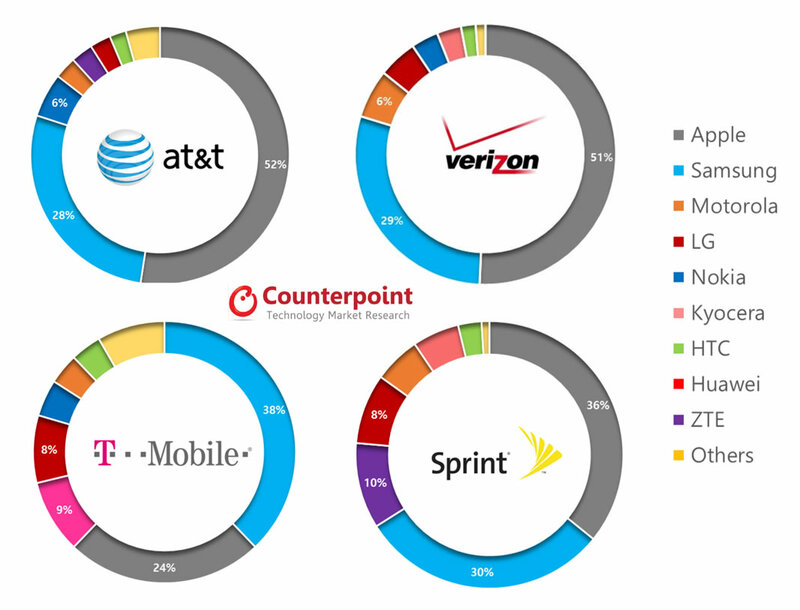 Counterpoint’s research also indicates that T-Mobile has overtaken Sprint to become the third largest smartphone carrier, trailing closely AT&T, and showing success of the company's Uncarrier strategy.